Some of you may have seen my tutorial on Suzannah’s fab blog Adventures in Dressmaking. She is very creative, with recent posts devoted to ruffled shirts. 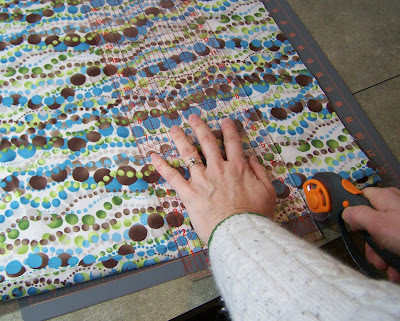 Her most recent post shows how to make a zig-zag rug like those that are all the rage. Check it out! 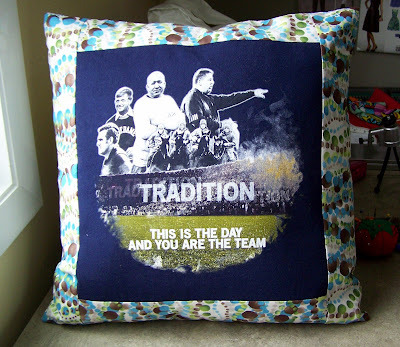 She invited me to write a tutorial for her blog so I chose to show how to make a pillow from old t-shirts. 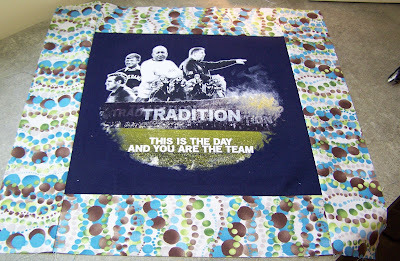 I make t-shirt quilts for my nieces and nephews as they graduate high school. My son will be graduating this year so I will finally get a chance to clear out a few of the 40 or so t-shirts in his closet! 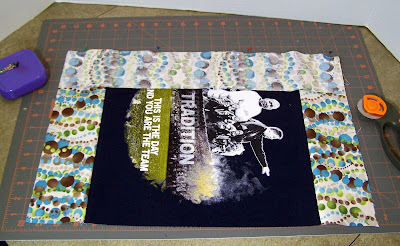 When I’m making the quilts, I use 12 t-shirt sides. Sometimes the kids can’t narrow down their favorites, so I make a pillow (or two) with the extras. 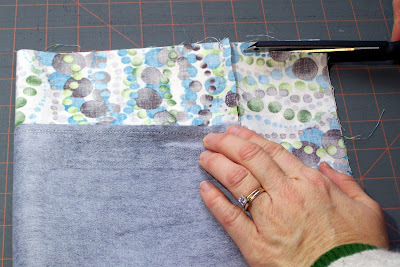 Today, I’ll share with you how to make a pillow based on my t-shirt quilt “block”. • Use a t-shirt front and back or two separate t-shirts. • The border fabric can be a contrast or coordinating fabric. 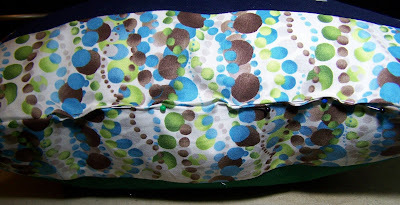 I have used polka-dots, tie-dye, and anything that does not have a directional pattern. My pillow fabric is Oxygen from Contemporary Cloth. 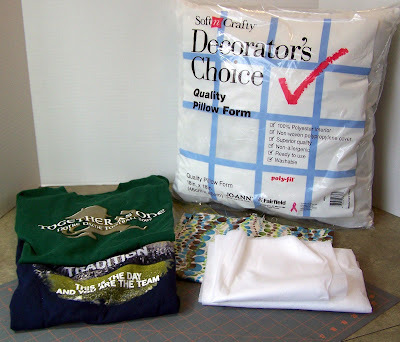 • Prewash the t-shirts and border fabric to preshrink them, especially if they are brand new. 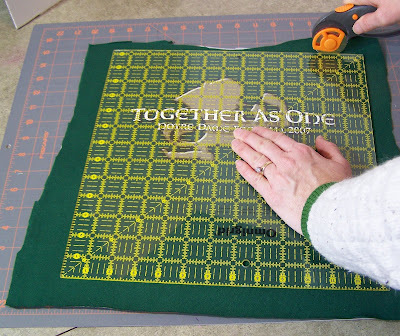 • It isn’t necessary to use an interfacing specifically designed for knits. The t-shirts will not need stretch for the pillow. 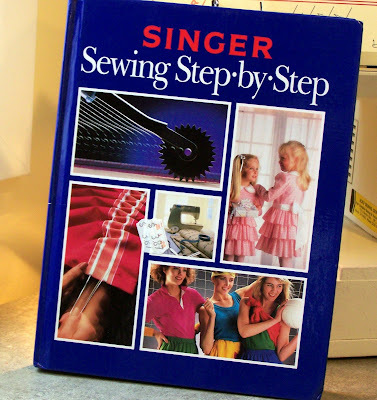 The interfacing is added for stability and ease of sewing. • Pillow forms are available in many sizes. 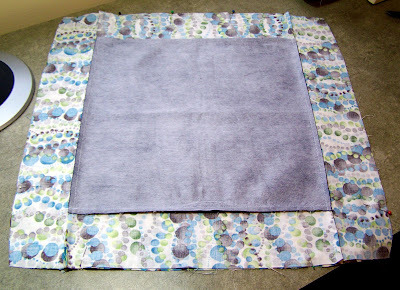 If you decide to make another size, you will want your completed square to be one inch larger than the pillow form. So if you want to make a 16” pillow, then you will design the square to be 17” before sewing the two sides together. 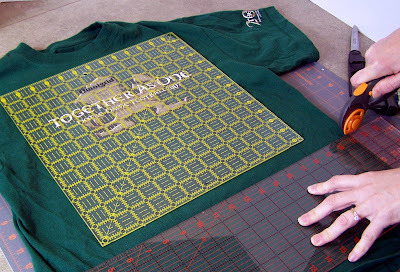 • When cutting the t-shirt into a square, I use an Omnigrid that has been custom cut to a 13 ¼” square template. You can make a cardboard template or simply measure and mark a square. 1. Rough cut square: The application of interfacing can cause the shirt to shrink so I cut a larger square than needed. 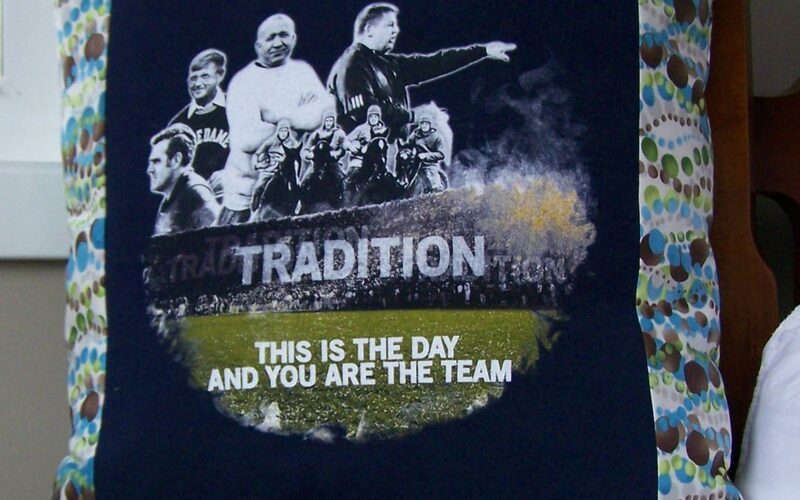 Place template over the desired area of the t-shirt. Cut the t-shirt out with an extra inch around the edges. 3. Apply interfacing: Apply the interfacing per the manufacturer’s instructions to the back side of the t-shirt. 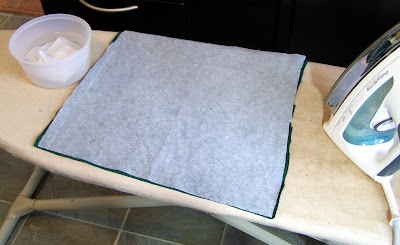 When I have large areas to fuse, I take an old plastic tub and fill it with water so that I can quickly dampen the hanky I use as my press cloth. Place the t-shirt on your ironing board with the logo side down. 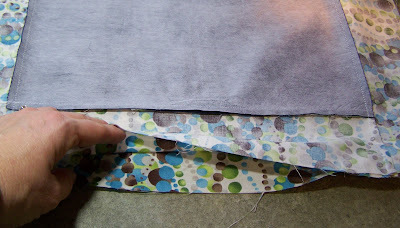 Then place the interfacing on, covered by a damp hanky. 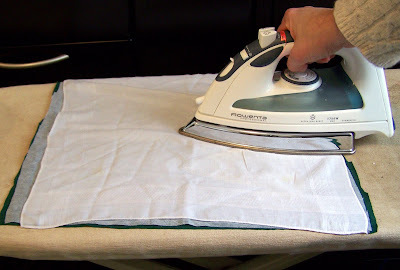 Fuse using a dry iron. When the hanky stops steaming, the fusing is typically complete. 4. 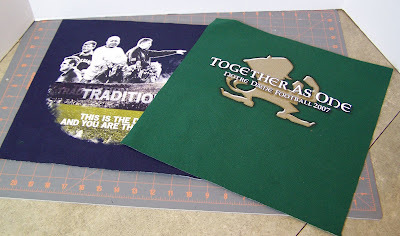 Cut the T-Shirts to 13 1/4″ Square: I use my Omnigrid to center the t-shirt design and cut using a rotary cutter. 5. 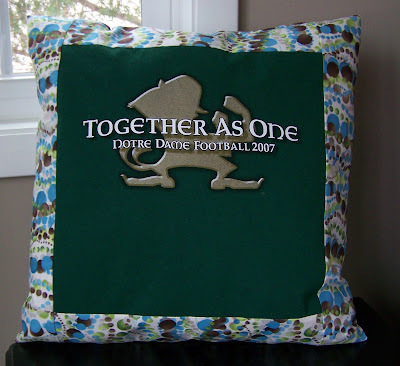 Assemble and Sew Pillow Top and Bottom: Pin the shorter border pieces to the top and bottom of the t-shirt. 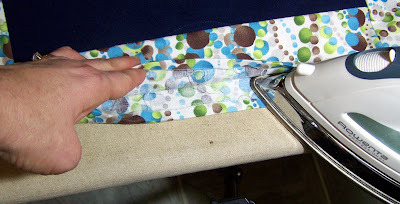 Sew or serge using a ¼” seam. 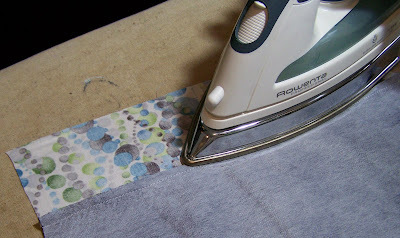 Press the stitching line and then press seams toward the border. When pressing, especially from the right side, avoid pressing the t-shirt logo. It can melt! Now pin the longer border pieces to the sides of the t-shirt. Sew and press. You now have a completed t-shirt block. Repeat for other t-shirt. I modify the pillow squares to remove excess fabric in the corners. Fold the fabric into fourths. Mark a point halfway between the corner and the fold on each open side. t the corner, mark a point 1/2″ from each raw edge. Trim from the corner to the center marks. 6. 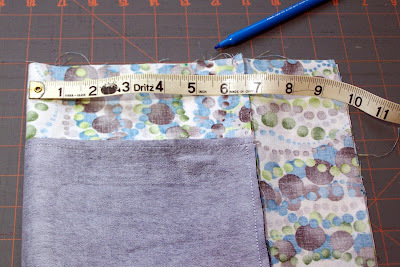 Sew the Top to the Bottom: Pin and sew the two squares together using a ¼” seam allowance. Leave an opening in the bottom to insert the pillow form. I usually leave about 10” open. 7. 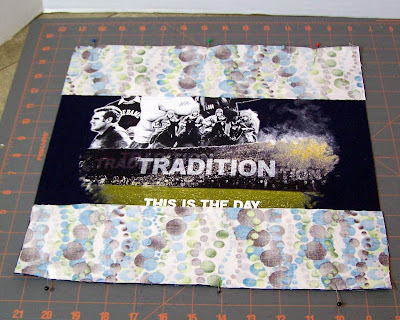 Turn Inside Out, Press Seams and Press Under 1/4″ on open edge. 8. 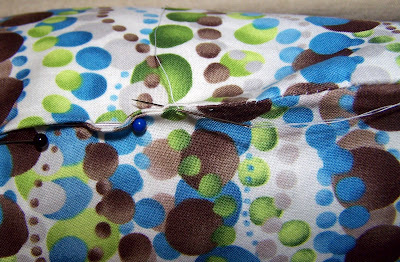 Insert Pillow Form and Hand Sew Opening: Pin the opening closed and sew closed using a slip stitch. You are so talented! What a great and through tutorial! Very cool! I love that pillow! We give you two thumbs up (actually four thumbs, since there are two of us) from French Picnic! Wow, what a cute idea. You are so creative. I love it! Oh, and I loved your comment 🙂 GNI is the best! What a clever idea! Great gift idea and a nice way to preserve a favorite t-shirt. My name is Jenny, I’m from Sweden, and I thought I would introduce myself as we’re both doing the Aventures in Lace KAL with Kate. It’s going to be so much fun, and I see it as a great opportunity to meet new knitting friends as well! Your blog is very nice, and the pillow tutorial was really awesome! I love tutorials with lots of photos, and yours was really easy to follow. I don’t sew myself, but I could actually see myself making one of these anyway! What a great idea! Thanks for making up such a through and well made tutorial! Cool! I found you via Totally Tutorials and I’m going to link from Dollar Store Crafts soon. Wish I could sew. But I might just try. What a great tutorial; very clear and beautifully executed. Thanks for sharing!